If you’d like to book or if you have any queries, do get in touch. You can contact us direct by phone, e-mail and post. You can also check availability and book online. The best time to call is between 9am and 8pm. If we’re not around please leave a message and we’ll call you back a.s.a.p. 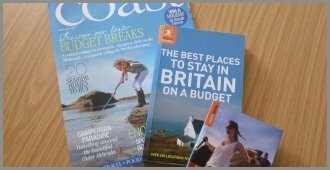 Featured in The Sunday Times travel section, The Guardian online, Coast magazine, The Trailblazer Guide to The Pembrokeshire Coast Path, The Celtic Trail Cycle Route 4 Guide and in ’52 Weekends by the Sea’. Here you’ll find a selection of recent reviews including what The Rough Guide and The Lonely Planet Guide have to say about us. Have a look on Tripadvisor and our guests’ comments on our on-line booking system too or, better still, come and write a review yourself in our good old fashioned visitors book!